TRAV and TRDV genes are designated by a number for the subgroup followed, whenever there are several genes belonging to the same subgroup, by a hyphen and a number for their relative localization. Numbers increase from 5' to 3' in the locus. TRAV15-2/DV6-2 and TRAV15D-2/DV6D-2 were assigned to the TRAV15 subgroup on the basis of sequence alignment, although they have not been found yet rearranged to TRAJ genes (Bosc, N., IMGT comment, 01/08/2002). Eight new pseudogenes identified by Inyoul Lee, Jared Roach and Leroy Hood (e-mail 08/06/2001 to M.-P. Lefranc) have been added to the map. Four of them belong to known subgroups: TRAV3D-2, TRAV15D-3, TRAV3-2 and TRAV15-3. The four others are single members of new subgroups: TRAV18, TRAV22, TRAV23 and TRDV3. 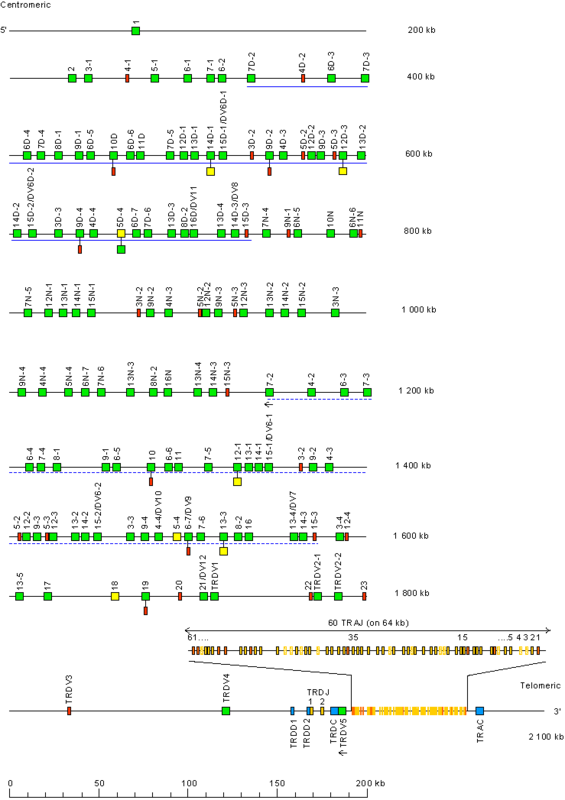 TRAJ genes are designated by a number according to their localization from 3' to 5'. Ortholog genes in human and mouse have the same numbers. No TRAJ10 has been identified in the mouse. In the TRA locus of Mus musculus C57BL/6J, there is an insertion of 300 kb between TRAV15D-3 and TRAV7-2, that corresponds to a triplication of part of the TRAV genes. The triplicated genes are indicated with the letter N in their name. 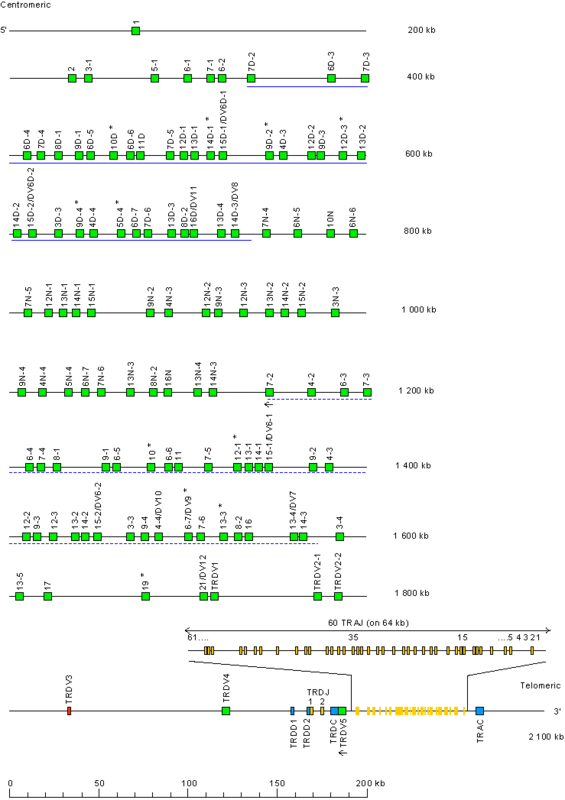 They comprise 34 TRAV genes (of which 27 are functional and 7 are pseudogene). The orientation of the house mouse (Mus musculus) TRA/TRD locus on the chromosome 14 (14C2) at 19.7cM is forward (FWD). The blue full line and the blue broken line below the map represent two parts of the locus which are duplicated. The TRAV genes of the proximal V-CLUSTER are designated by a number for the subgroup, followed by a hyphen and a number for the localization from 3' to 5' in the locus. The TRAV genes of the distal duplicated V-CLUSTER are designated by the same numbers as the corresponding genes in the proximal V-CLUSTER, with the letter D added. Single arrow under TRDV5 shows the polarity is opposite to that of the TRD D-J-C-CLUSTER. •	No 5' borne conserved between species has been identified upstream of TRAV1 (F), the most 5' gene in the locus. •	DAD1 (defender agaisnt cell death) (3' borne) has been identified 11 kb downstream of TRAC (F), the most 3' gene in the locus. Wilson R.K. et al., unpublished (2006). Wilson et al., Genomics, 13, 1198-1208 (1992). Koop et al., Genomics 13, 1209-1230 (1992). Seto, D. et al., Genomics, 20, 258-266 (1994). Rowen, L. et al., unpublished (1997). Iwashima, M. et al., Proc. Natl. Acad. Sci. USA., 85, 8161-8165 (1988). Bosc, N., Scaviner, D., Folch, G., Ginestoux, C., Giudicelli, V. and Lefranc, M.-P. IMGT overview: the mouse T cell receptor alpha TRA genes. 19th International Mouse Genome Conference (IMGC), November 5-8, 2005, Strasbourg, France (2005). .
 Bosc, N., Folch, G., Ginestoux, C., Giudicelli, V. and Lefranc, M.-P. IMGT overview: the mouse T cell receptor delta TRD genes. 19th International Mouse Genome Conference (IMGC), November 5-8, 2005, Strasbourg, France (2005). .